Now a museum, the Churchill War Rooms is actually the underground bunker system beneath Whitehall from where Churchill directed operations during the Blitz of World War II. The subterranean complex includes a series of historic rooms where Churchill and his cabinet met which remain in the same state they were in when the lights were switched off at the end of the war in 1945. There’s also a substantial cutting-edge museum dedicated to exploring Churchill’s life which boasts an interactive “lifeline” containing more than 1,100 images and a similar number of documents as well as animations and films. With the coming conflict on the horizon, the complex was constructed from 1938 to 1939 as an emergency government centre in the basement of the now Grade II* listed government building then known as the New Public Offices (and now home to HM Treasury). It became operational on 27th August, 1939, shortly before the outbreak of the war. Key rooms include the Map Room (pictured, top, it was manned around the clock by military officers producing intelligence reports) and the War Cabinet Room where more than 100 meetings of Cabinet were held (including just one gathering of Prime Minister Neville Chamberlain’s cabinet in October, 1939). 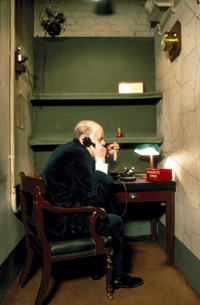 Other facilities included a private office/bedroom for Churchill (this came with BBC broadcasting equipment which Churchill used four times and, although it had a bed, Churchill apparently rarely used it), the Transatlantic Telephone Room (pictured above, it was disguised as a toilet) from where Churchill could speak directly to the US President. There are also staff dormitories, bedrooms for officers and government ministers, and rooms for typists and telephone switchboard operators. In October, 1940, a massive layer of concrete – up to five feet thick and known simply as ‘The Slab’ – was added to protect the rooms. Other protective devices included a torpedo net slung across the courtyard overhead to catch falling bombs and an air filtration system to prevent poisonous gases entering. Abandoned after the war, the premises hosted some limited tours but, despite growing demand to see inside, it wasn’t until the early 1980s when PM Margaret Thatcher pushed for the rooms to be opened to the public that the Imperial War Museum eventually took over the site. The museum opened on 4th April, 1984, in a ceremony attended by the PM as well as members of Churchill’s family and former staff. Then known as the Cabinet War Rooms, they were extended in 2003 to include rooms used by Churchill, his wife and associates, and, in 2005, following the development of the Churchill Museum, it was rebranded the Churchill Museum and Cabinet War Rooms. 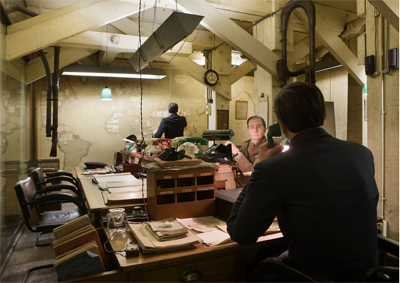 In 2010, the name was shortened to the Churchill War Rooms. The entrance to the premises was redesigned in 2012. Among the objects in the museum are one of Churchill’s famous “siren suits”, an Enigma machine and the flag from his funeral.